Over the last few months, I’ve had cause to concentrate my focus on the theory and practice of turning protest into power, to an extent that I probably haven’t done since the mid-90s. The campaigns-related side of public relations, and best ways of developing effective strategies are obviously things which have dominated my time as a communications practitioner, and then in teaching in around ten years as a lecturer on the subject, but I’ve been reflecting enough of late to feel the urge to post my thoughts here. 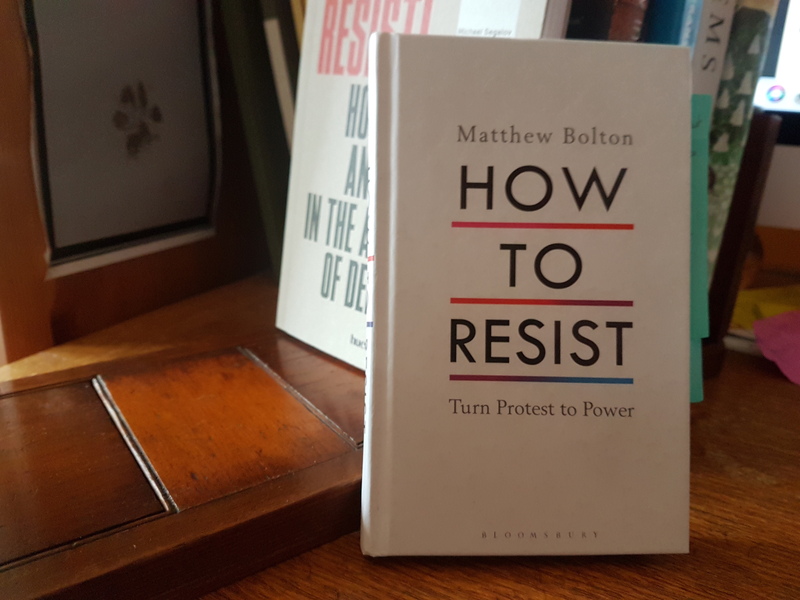 It began after reading ‘How To Resist: Turn Protest Into Power’ by Matthew Bolton (2017: London, Bloomsbury). This post would have remained a simple book review. I didn’t realise that I had failed to type up the notes I had made on the book, but in the intervening period, I managed to get embroiled in the democratic process more than I had intended. I’m now co-leading a group of local residents where I live examining issues connected with “Getting Around” as our local town council look towards developing a new neighbourhood plan) – as well as finding myself leading a very measured protest against the axing of a community bus service, so I may as well bring these three things together into a single post on the theory and practice of ‘resisting’. And back in the middle of October, I had the added benefit of attending the launch of the RSA ‘TeenAgency’ which provides further scope for reflection on some of these themes. I’ll begin with the book, as it had been on a pile of purchased, ‘yet to read’ titles by my bed, but circumstances conspired over the summer to make it even more attractive to read. With Brexit weakness and incompetence being displayed by our political class; Austerity-fuelled policies serving to deprive citizens of meaningful innovation or control over public policy, and a series of gigantic moral outrages such as Windrush and Grenfell, I know from my experience, and that of my peers that we have never felt so in need of political solutions, but equally, never so emasculated by the paucity of quality on offer from our party political system. Having been involved to some degree in campaigning during my professional life too (only to feel let down by the bastardisation through a thirst for votes of some of the original campaigning ideals of the ‘community politics’ approach I had been introduced to as a teen by the Liberals), this new book tantalised me. It is penned by Matthew Bolton, who has been at the heart of the Citizens UK movement, and as such, is able to call upon lessons from practical campaigns (and wins at that) such as for the Living Wage, particularly on campuses of specific universities, for their cleaners, and for contract cleaners at HSBC. The book is full of valuable lessons, such as the need for anyone embarking on any campaigns to do a ‘power analysis’, not just of structures, but of people, not just external to the campaign, but within it too. Also, the need to ask oneself, “What can I do in my everyday life to affect this?” – it might not just rely on megaphones and banners. Indeed, if I had any criticism of the book (and I don’t really), it would be that I would like to see more dedicated to this last aspect, as well as the time/attention given to the flair with which we can try to trip-up wrong-doers who might have excessive power. I’d maybe like to see as much attention given to the leading by example stuff, which I think probably has more scope in a tired and cynical age. So, what other signposts for us? The importance of relationships – of the human aspects in our lives, in ultimately achieving change. For example, activating word of mouth. In addition to power analysis, other priorities for Bolton are listening (what do people care about? What is their self-interest? How do they frame issues? ); the need to constantly look out for potential team members; the importance of honing your story; and looking at both internal and external action as different priorities. Once you get the ball rolling, numbers will ultimately be important – a critical mass. Networks and word of mouth are the best way of achieving this, and those direct relationships. Direct, broadcast shortcuts might be attractive, but they are no substitute. Activity to achieve this, more often than not, must be meaningful (not gimmicky), yet enjoyable. Bolton does propose some ideas to help with ‘tactical innovations’ in delivering campaigns – a phrase I picked up from a discussion I heard on a BBC World Service show (an episode of ‘The Real Story’), about whether protests have had their day, in the light of the ‘blimp’ during Trump’s visit during the Summer of 2018. It was coined by L.A. Kauffman (Direct Action and the Invention of American Radicalism), who argued that you often need such devices merely as ‘troop motivators’ during bleak times. Also on Ritula Shah’s panel were David Graeber, Dana Fisher, and Fatima Shabodien. You can listen to the show by clicking here. I thoroughly recommend it. Click through to listen to this discussion on Protest. * look after yourself/pace yourself; * ask yourself what you really care about, to best identify motivators; * stop doing some things; delegate others; * weave social change into your life, to make it more effective and fundamental; * do it as part of a team; * be strategic; make a plan; * take control of your schedule, and ensure it includes one-to-one conversations; * find time. Bolton ended with an iron rule – never do for others what they can do for themselves. I don’t always practice what he preaches, but I do see it’s importance. This is important. It’s where I came in. It’s what that ‘community politics’ thing was supposed to be about, but politicians liked doing things ‘to’ people, because it helped them collect votes. This should be about showing people how to do it for themselves – and the thrill of the transformative effect for themselves and the community when they do. Otherwise, we will be back to square one very quickly. I’m not at all sure that there is much hope – but we have to be optimistic that it is worth a try – and willing to laugh at the absurdity of the mess we currently find ourselves in. Using Slinkachu-style models as a consultation tool for qualitative research in local community cafe, Cafe 46. Being in that frame of mind, and having read ‘Resist‘, when I saw that the Town Council group on my local patch working on creating a new Neighbourhood Plan earlier this summer, as a way of creating a shared vision for our town, and providing an ‘additional layer of control’ over development decisions’ were having a public meeting, me and a friend went along. We came away, having ‘stepped up to the plate‘, volunteering together to co-lead the subject group looking at transport and traffic issues. We already felt we had made a difference by getting agreement for its focus to shift to “Getting Around” so it can look at issues for pedestrians, cyclists, wheelchair users and users of public & community transport too, as a one of the best ways to solve issues for drivers stuck in jams and looking for a parking space. My own personal motivation was having to surrender my driving licence a few years ago due to my neurological condition, I discovered just how woeful public transport has become. Despite being the second largest town in our district/borough, we have no bus connection to the largest town (despite it being only four miles away), no direct bus connection to the mainline London Waterloo railway services, and the last bus back from the nearest major town leaves there at 8.50pm! Some days I have a real ‘high’ about the possibilities the process gives us, and just what level of innovation may be deliverable. On other days, I am down in the doldrums, worried that it all might just be a toothless paper exercise (I have bad experiences of public sector ‘consultations’). I’m sure the answer lies somewhere in between, and I just have to manage my expectations – but if you don’t take part, you can’t shape things. In addition, as well as the formal process of creating a Neighbourhood Plan, the whole thing means conversations are happening that wouldn’t otherwise happen; the seeds of other campaign ideas are being planted; and networks are being created in the process, so it’s a valuable thing in itself for that reason, if nothing else. 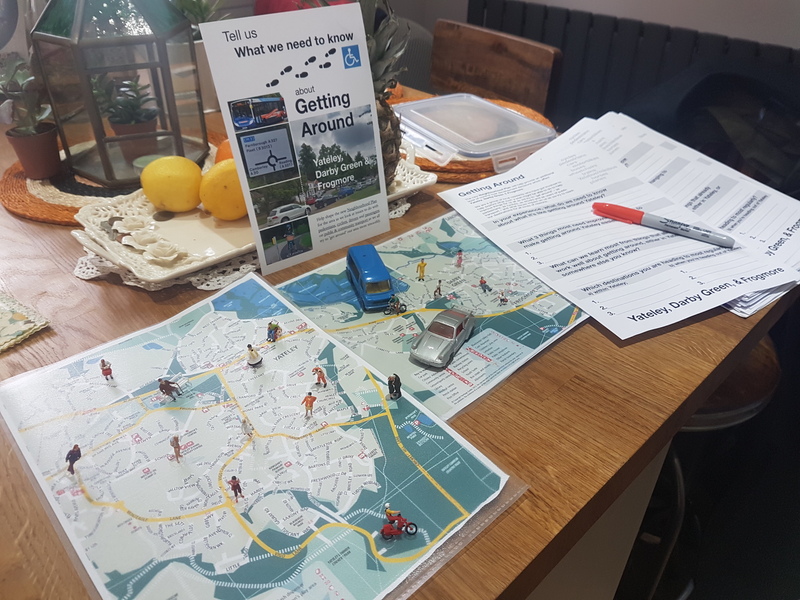 You can read blog posts on the specific journey of our ‘Getting Around‘ group of the Yateley, Darby Green and Frogmore Neighbourhood Plan in our beautiful corner of North-East Hampshire at https://ydf-np.org.uk/getting-around/ . The regulars on the free community bus facing the axe by Sainsbury’s. I mentioned those days when I am in the doldrums. One reason I had good cause to be reminded of why the clouds can often obscure my optimism is when Sainsbury’s recently announced with no notice that they were axing a valuable community resource – a free shopper’s bus which takes many older people, and disabled as well as other members of the community to a local superstore (Watchmoor Park, Blackwater Valley Road) otherwise inaccessible by public transport. 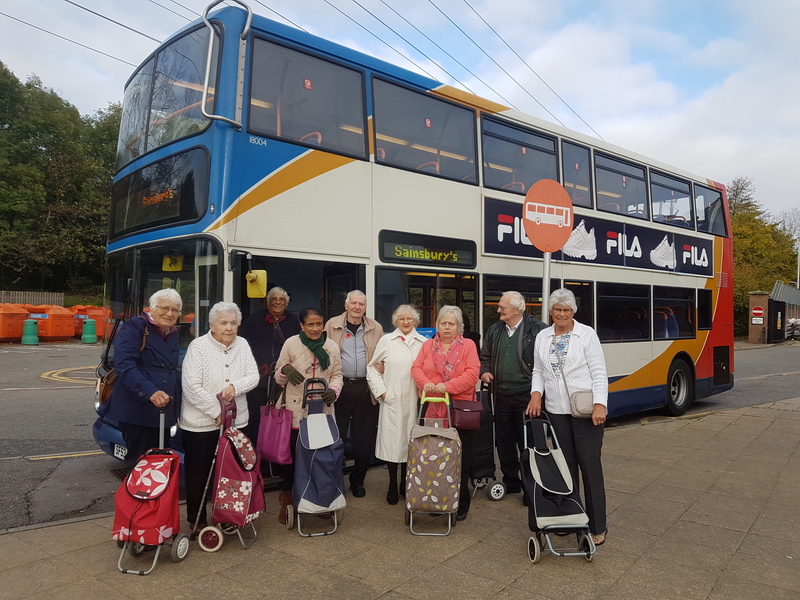 Many of these people are not on the internet either, and the Stagecoach contracted bus delivers passengers right back to their doorsteps with their shopping. The reason I felt so down? A little research on my part in the neighbouring council offices (Surrey Heath) unearthed the fact that Sainsbury’s were legally obliged to be providing the bus service as a condition of them securing planning permission for an extension to the store back in 2004! Despite this, Sainsbury’s have felt able to ignore this, and no democratic scrutiny or enforcement has stopped them from doing so. Hopefully, an intervention from me, with support from fellow passengers and a local councillor will get the wheels of legal enforcement moving by the local authority – but it may be too late to stop an interruption to the service on which many rely. If the bus does end, despite my success in navigating the system and getting the supermarket’s ‘collar felt’, I will find it difficult to have any faith in shaping future planning policies, if I’ve just seen a historical planning condition which affects so many people woefully ignored! Still, it has been a good example of putting some of the lessons of Matthew Bolton’s book into practice – particularly with regard to power analysis, and the importance of relationships. Yes, posting on Facebook groups, photo-opportunities, yes, but some of the most valuable insights were about talking to the people affected by the issue, and understanding the real heart of the power when it comes to the problem. I’ve already combined a lot of things into this post, but I will touch on one other. I was lucky enough to attend the mid-October launch of the RSA report “TeenAgency” on how young people people are changing the world, and how best to support them in their efforts to make a difference in their communities. It deserves a post in its own right, and I will hopefully get round to doing so in due course. Panellists Ruth Ibegbuna (founder of the RECLAIM project in Manchester, and now of the Roots Programme) and Sam Conniff-Allende (founder of Livity, and now author of ‘Be More Pirate‘), together with some particularly powerful contributions from young people on the panel made strong points about the need to have ambition and imagination in supporting youth-led social action, and rather than accepting ‘tokenism’ which creates ‘special panels’ with a place for a young person reserved on them, we need to always question where power lies, and be prepared to help mentor young people to support them in building networks for themselves, and busting open established power structures, because it will probably benefit us all in creating a more open, transparent, supportive and dynamic society for all, not just for young people. I was lucky enough to go along to the launch of the report with a few friends:- Ed Mather (the director of Yateley Sixth Form, at my local comprehensive, Yateley School); a good friend, Luke Buckland (who is co-leading the subject work I talked about earlier on our local Neighbourhood Plan), and a best friend who is soon to take up post in an exciting new academic leadership position when a powerhouse brand will take all its prestige and head-turning ‘clout’ and use it to make new moves in higher education. We’d arrived after only having just met-up with one of my first bosses, Sir Simon Hughes, who has recently been installed as the new Chancellor of London South Bank University. These networks, built from the friendships you assemble along the path you tread in life’s rich tapestry can also form the basis of some interesting partnerships, and the germ of some creative ideas when you campaign. They need to be celebrated, nurtured, and above all, shared with a new generation. One point which came out powerfully in the ‘TeenAgency’ event is that there are some people who are born into classes with these networks ‘ready made’, or bought, courtesy of private education. The rest of us must make common cause to overcome that advantage of others – and often, it only takes a knock on a door, or a simple request to get that access shared. We need a bit more solidarity! And perhaps I need to write shorter posts! I’ll return to some of the more specific issues I’ve in bite-size form in future posts. Thanks for bearing with me!